Note the Name and Date are unused (blank). 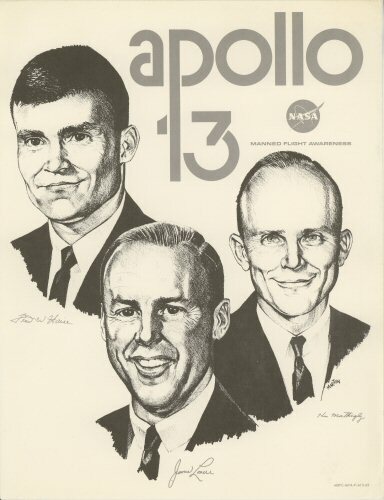 This fine vintage NASA lithograph is in near mint condition. This fine vintage M&W letter is in good to poor condition. With age stains and a slight paper clip dent where the lithograph was attached. Has a nice vintage aged appearance. 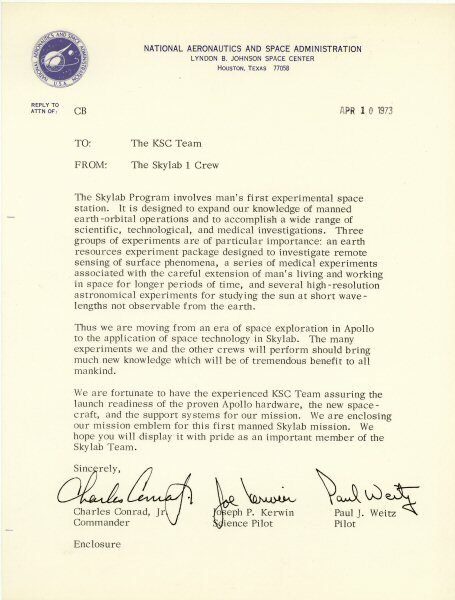 With the crew's pre-printed signatures. 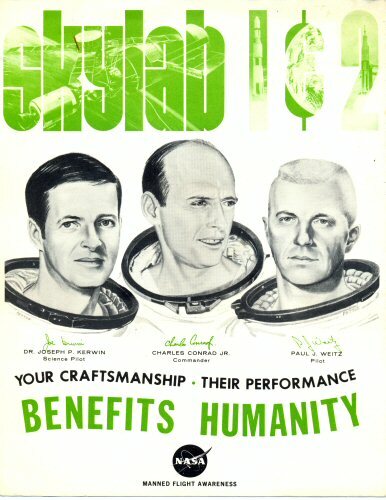 This fine vintage NASA lithograph is in good to poor condition. With age stains and a slight paper clip dent where the lithograph was attached to the letter. 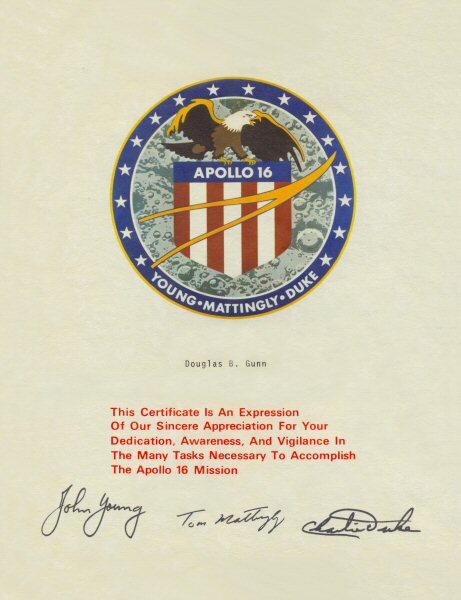 A outstanding Crew Certificate of Appreciation printed on very fine U.S. Government parchment in mint condition. Another outstanding Crew Certificate of Appreciation printed on very fine U.S. Government parchment in mint condition. 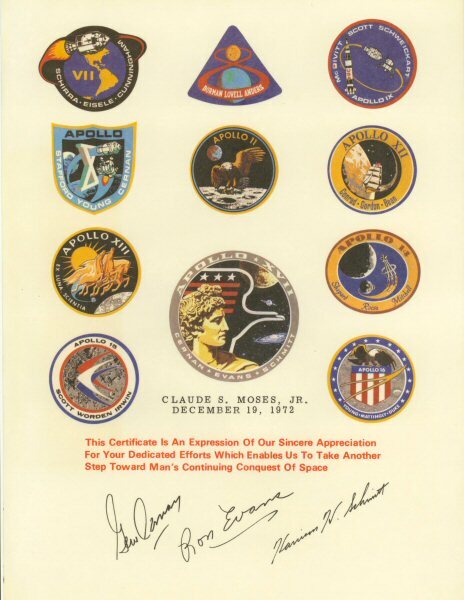 To: Claude S. Moses Jr.
A fantastic Certificate of Appreciation printed on heavy acid free stock. 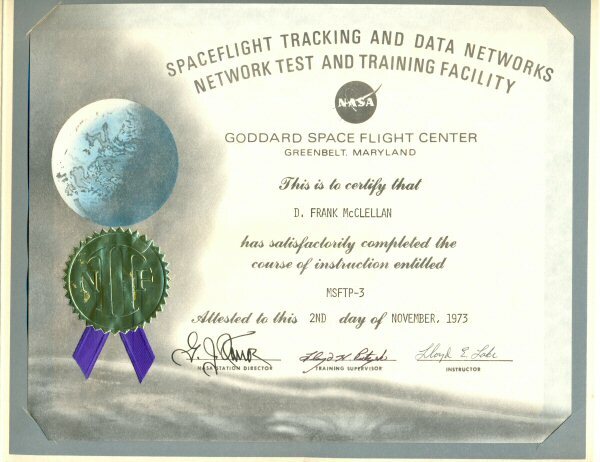 This very fine vintage NASA certificate is in mint condition. 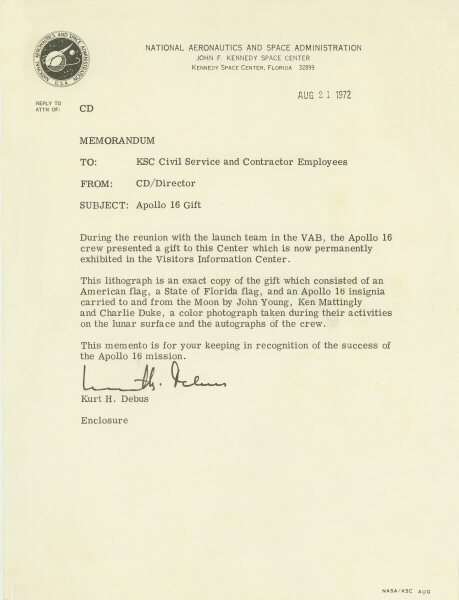 This very fine vintage NASA letter is in very good condition, near mint. 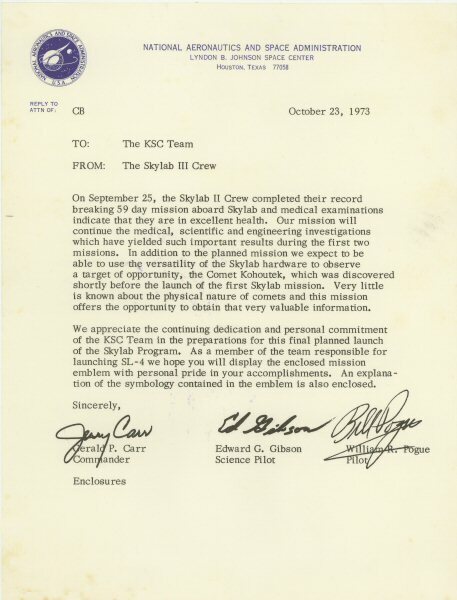 Goes with the above letter from Dr. Debus, NASA Director dated 21 August 1972. 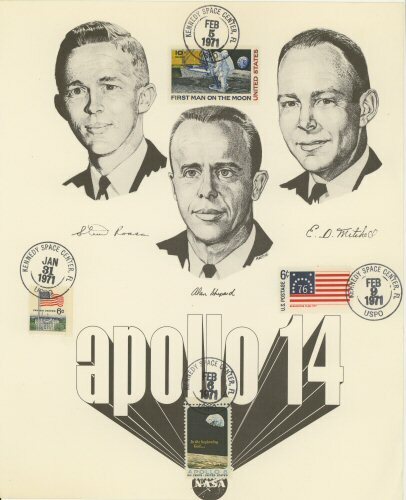 This very fine vintage NASA lithograph is in near mint condition. A outstanding Certificate of Appreciation and the bonus is all the previous Apollo manned mission patches. 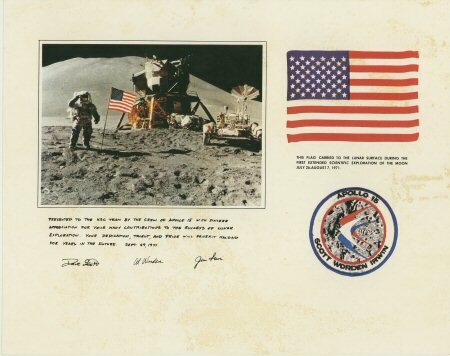 This fine vintage NASA certificate is in mint condition and printed on very fine U.S. Government parchment. 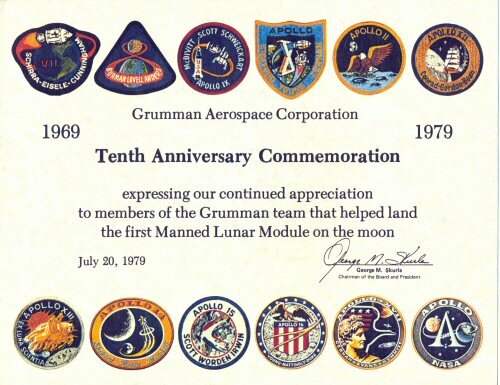 Signed by George M. Skurla, Chairman of the Board and President of Grumman Aerospace Corp.
A outstanding Certificate of Appreciation to the members of the Grumman team that helped land the fist Manned Lunar Module on the Moon. 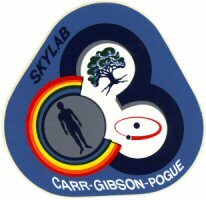 Showing the Apollo Program and Apollo Manned Mission patches. This very fine vintage certificate is in mint condition and printed on heavy parchment. 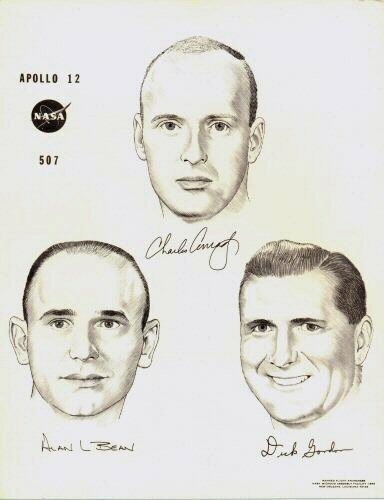 Same weight as a Official NASA Lithograph. 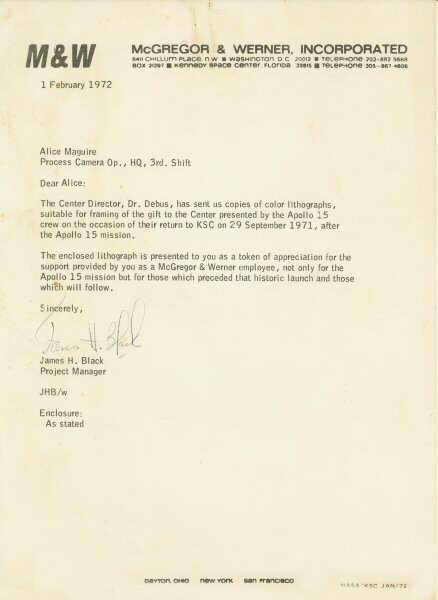 This very fine vintage NASA letter is in very good condition. Goes with the above letter from Mr. Scherer, NASA Director dated 12 January 1976. 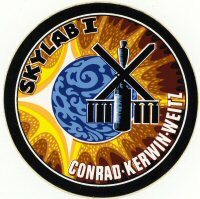 Vintage sticker shown below is the standard NASA issue 4" colour mission emblem sticker. 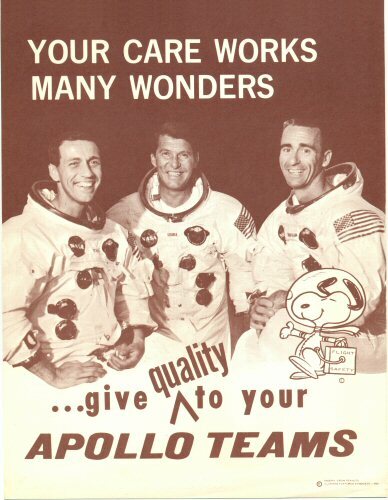 It is the original vintage sticker that was enclosed with the autopen letter. 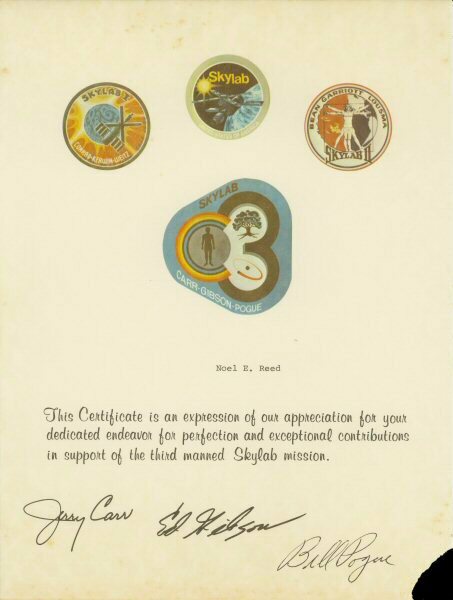 This vintage NASA letter and mission sticker are in near mint condition. 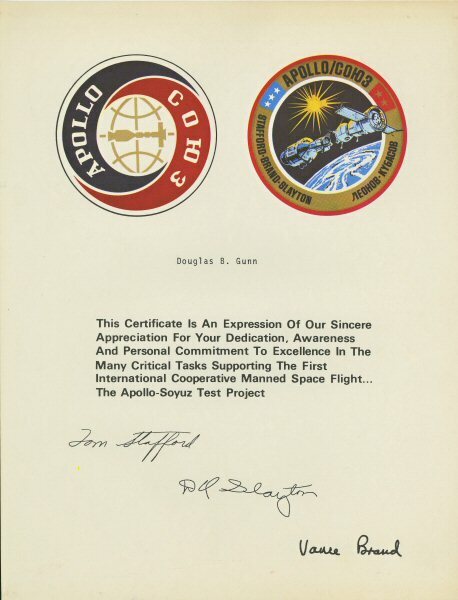 A outstanding Crew Certificate of Recognition printed on very fine U.S. Government parchment in very good condition. However it does has a few very slight age spots. 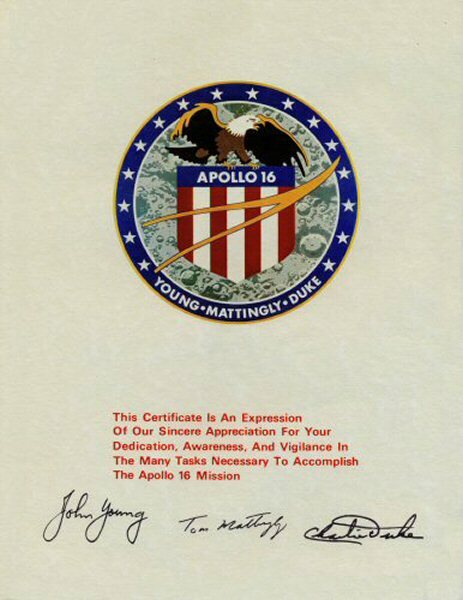 A outstanding Crew Certificate of Recognition printed on very fine U.S. Government parchment in good condition. However it does suffer from age discoloration. No spotting just overall toning. As the aging is fairly uniform it gives this item a very nice vintage look. 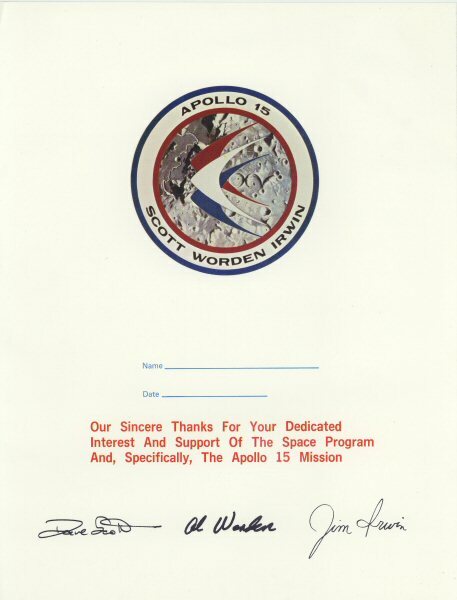 This vintage NASA letter and mission sticker are in very good condition. 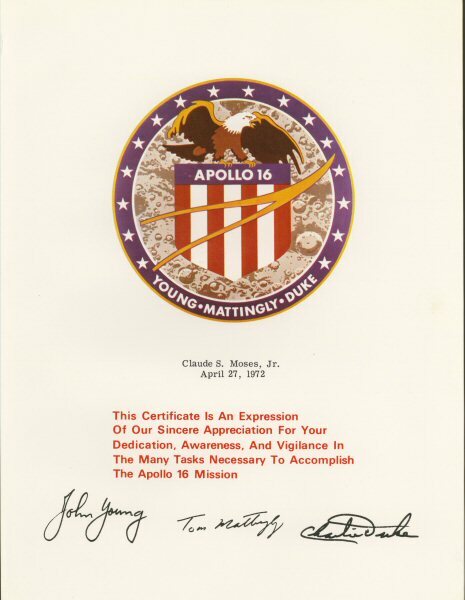 A outstanding Crew Certificate of Recognition printed on very fine U.S. Government parchment in poor condition. It suffer from age discoloration and a torn lower right corner as seen. 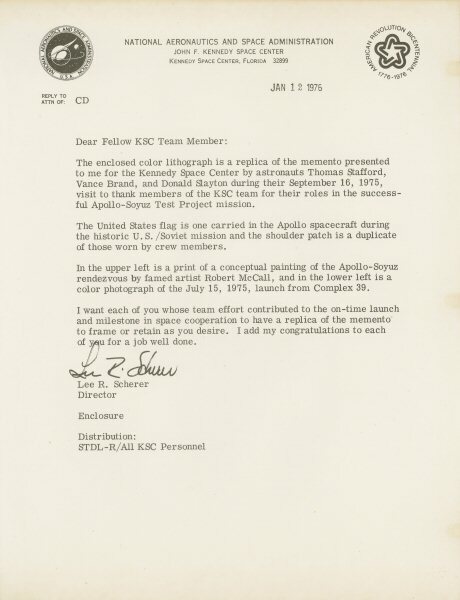 A bit of History that you do not see very often. This fine vintage Certificate is in near mint condition. 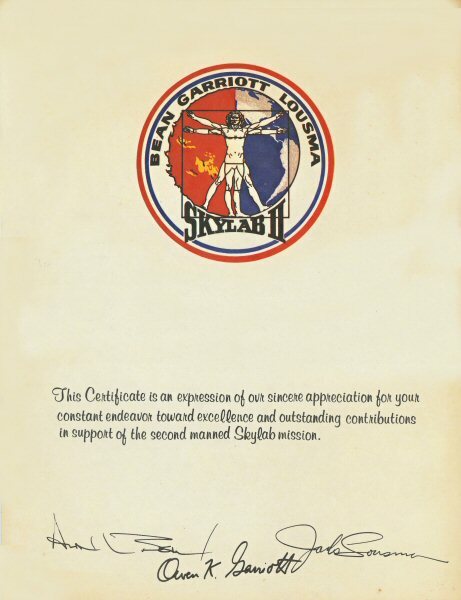 The certificate opens to reveal the diploma inside and the front and back cover as seen below. 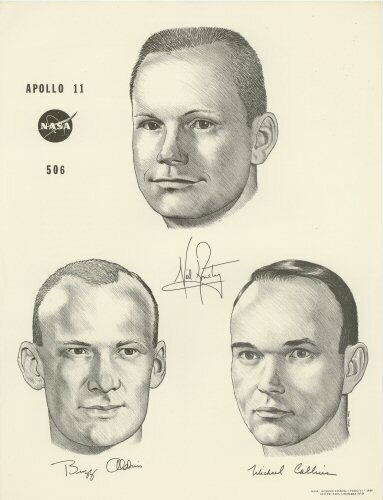 Drawing by Ron Juge with pre-printed signatures. "NASA - Michoud Assembly Facility - 1969 - New Orleans, Louisiana 70129"
This fine vintage NASA Lithograph is in poor good condition. It has some age stains along the right side. 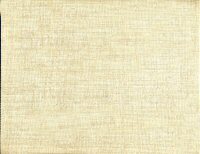 Printed on thin acid free stock. 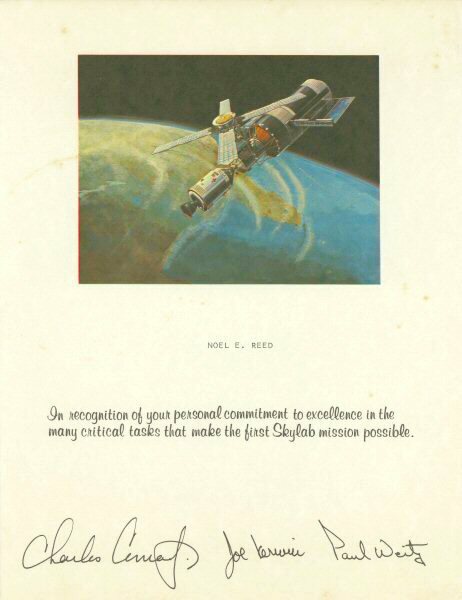 This fine vintage NASA Lithograph is in Very Good condition. Printed on thin acid free stock.
" 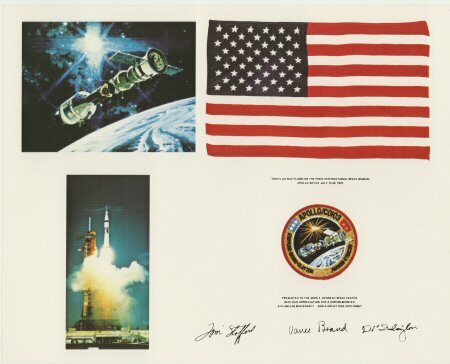 Manned Flight Awareness - NASA - Michoud Assembly Facility - 1969 - New Orleans, Louisiana 70129 "
This fine vintage NASA Lithograph is in Very Good condition. 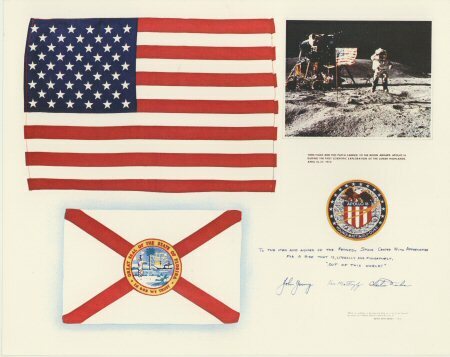 Printed on thin acid free stock that is the same weight as a Official NASA Lithograph. 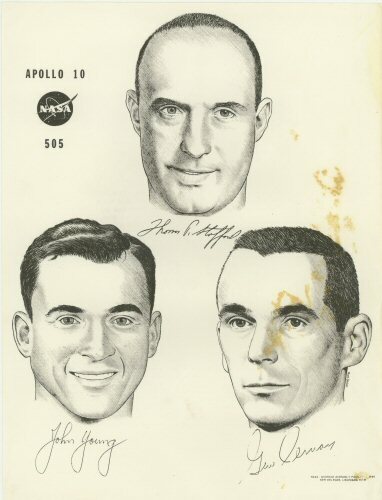 This fine vintage NASA Lithograph is in Very Good condition. Printed acid free stock that is the same weight as a Official NASA Lithograph.